Big strong 04 OF/P with a big time future as a hitter. Plus power potential, the ball jumps off his left-hand bat at MLB speed. He has a beautiful swing, stays inside and attacks under control. One of the best hitters in Houston, maybe the best! A strong arm is included in this package. He needs to improve his 60 time a little and he has a high draft pick waiting. Heading into the ’07 draft, Baseball America rated Savery the #3 prospect in Texas and #21 in the country. In its report, BA commented on Savery primarily as a pitcher, noting that a bone spur that led to some labrum fraying had taken away some of his dominance, but that he could be a steal if taken in the second half of the first round. 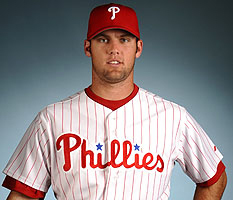 The Phillies ultimately made Savery the 19th pick and signed him in mid-July. For what it’s worth, Savery has put up a .283/.311/.384 slash line over 108 career plate appearances and has struck out just 14 times. Summary: Its almost impossible to rate Savery’s hitting tools since he hasn’t been a full time position player at any point. He was a 2 way guy at Rice and showed good skills, but it was against college competition in limited duty. He’s gotten a few reps as a pro, but its hard to say how his tools will translate over a full season. He should have at least average contact and power skills, and his arm strength is obviously plus, but wasted at first base. He’s a total wildcard. Upside: Well, who knows? There isn’t a lot of precedent for pitchers making the conversion to hitters, especially among fairly high-profile draftees. Rick Ankiel aside, the only others that jump to mind are Brian Bogusevic and Adam Loewen. Loewen was the 4th overall pick in 2002, made 35 major league appearances with Baltimore before a stress fracture in his elbow ended his pitching career and forced a switch. Last year at age 26, Loewen put up a .246/.351/.412 slash line in AA in Toronto’s organization. Bogusevic was the 24th pick in the ’05 draft, although unlike Savery, there was much more uncertainty as to whether he’d be used as a pitcher or a hitter. After 3 ½ ineffective seasons as a starting pitcher, he was converted to an outfielder and is now on the precipice of sticking in the big leagues, most likely as a platoon or bench bat for the Astros. Savery reportedly hit well in the Instructional League while playing first base. Benny Looper has said that Savery will start at as high a level as possible and didn’t discount that level being Reading. As a point of comparison, it took Bogusevic roughly 1,100 plate appearances post-conversion to get to where he’s at; Loewen’s currently up over 900. 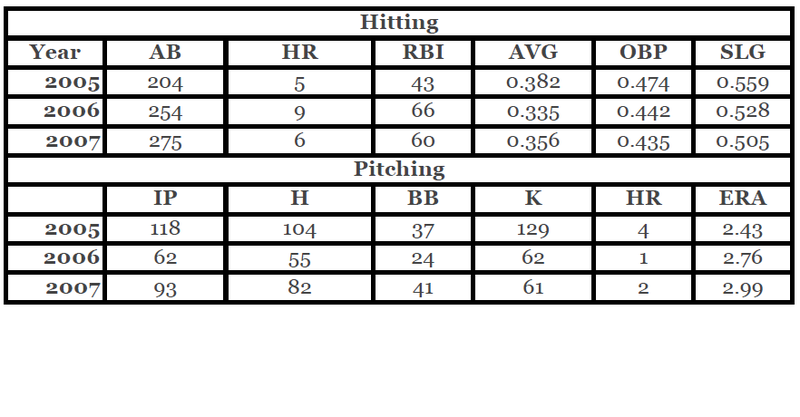 The focal point for Savery in 2011 should be on getting plate appearances, not necessarily on results. After 550 plate appearances, we should have a better idea on how this experiment might play out. The Phillies would be happy to get a Bogusevic platoon-type bat out of him. Cheese you forgot the Babe made the switch. Many pitchers made the switch to hitting in the early ’20s. Besides Ruth there was Smokey Joe Wood, Lefty O’Doul, George Sisler, Rube Bressler, Buzz Arlett, Sam Rice, Charlie Jamieson and others. But that was a time when the strategy of the game dramatically changed. Its probably not particularly relevant to Joe Savery. And it changed because of Ruth and even O’doul who were allowed their own swings because they were pitchers. Ruth was allowed his own swing. What happened then was that a good hitter became more valuable than a good pitcher. To digress from that train a moment, if you draw up a list of best hitting pitchers you’ll find that pitchers’ hitting has declined historically. Good players from the past sometimes excelled at both ends of the diamond. And its not just the DH. The pre-WWII pitchers were better hitters than the 1945-72 pitchers. The players who switched were players who could’ve gone either way in the first place. In Savery’s case, the real difficulty is that he has limited experience against advanced pitching. He has looked good initially but the more PAs he picks up, the more scouts and opponents are going to be able to pick apart his strengths and weaknesses. How Savery responds to that adjustment will determine his future. If Savery can give us 2000+ PAs of .269/.306/.389 like Red Ruffing put up, we’ll be thrilled. Just thought Bogusevic might be a more appropriate comp when I was writing the profile. Will we? That line doesn’t look so good coming from a 1B as opposed to a pitcher. Loney had a .723 OPS last year. Garrett Jones was .720. The hypothetical line above is at .695 (close enough). I’d say yes, if Savery turns into an almost-James Loney at this point, I’d be thrilled. I don’t think Dodger fans were exactly thrilled with Loney though. We honestly have four hitters either on the bench or in the minors right now who could play first base everyday and beat a .695 OPS (Ross Gload, Matt Rizzotti, Jeff Larish, Tagg Bozied). Oh, I agree with you. But in the context of Savery being a bust as a first-round pitcher, if he manages to successfully convert and become Loney, that’s a huge win a this point. And I agree that all those guys you mention could play everyday and beat that OPS, but I also don’t think Savery will ever be an everyday 1B.